The Ecotex TravelMate® is made from 3 recycled water bottles. By utilizing discarded materials to create new products Heys offers an Eco-friendly choice for a clean and sustainable future. What is Ecotex ? The Ecotex TravelMate® is actually 2 bags in 1, as it comes with a BONUS Passport Bag with a neck strap so it can be worn under or over your clothes. The Ecotex TravelMate® itself is worn across your chest so that your hands remain free at all times. It is virtually pick-pocket proof as the flap prevents the zipper from opening fully. 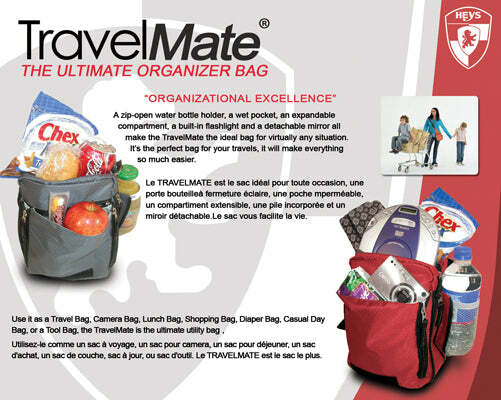 The Ecotex TravelMate® has 12 compartments for your organizing pleasure and is EXPANDABLE. 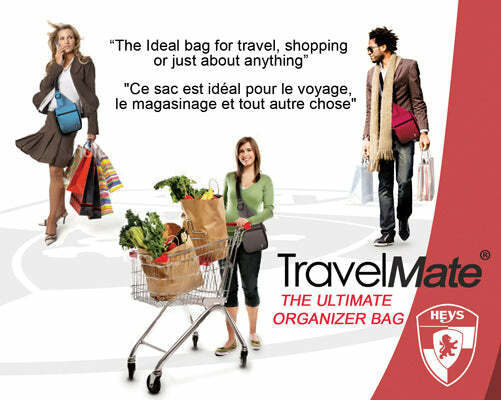 Be sure to watch the Video for an overview of the TravelMate®. It also comes with a mini Mirror - Both of which are detachable from the EcotexTravelMate®. It has a special wet-pocket to keep items dry, and a easy access cellphone pocket, as well as zip-open Water Bottle pocket.